DES MOINES – The Iowa Barnstormers have signed running back Keshaudas Spence, Head Coach Dixie Wooten announced. Spence (5-10, 235, Sacred Heart University) joins the Iowa Barnstormers for his second season in the Indoor Football League (IFL). 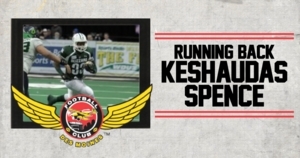 In 2016, Spence appeared in 15 games with the Green Bay Blizzard where he scored 11 rushing touchdowns and one touchdown reception. Collegiately, Spence attended Sacred Heart University where he had a career rushing record of 3,745 yards, single season rushing record of 1,669 yards, and was third in school history for career touchdowns with 30. Spence made his debut with the Barnstormers this past Sunday at Wells Fargo Arena for the team’s home opener, where he scored two rushing touchdowns. Season Tickets for the Iowa Barnstormers 2017 season are still available! For as low as $80 per seat, fans can enjoy the action from the same great seat location each game. For more information, call the Barnstormers at (515) 633-2255 or log on to www.theiowabarnstormers.com.